Automation is an important part of a complete email marketing program. It allows the person in charge of email marketing to work on other things while the emails that don’t require their attention are sent out automatically. 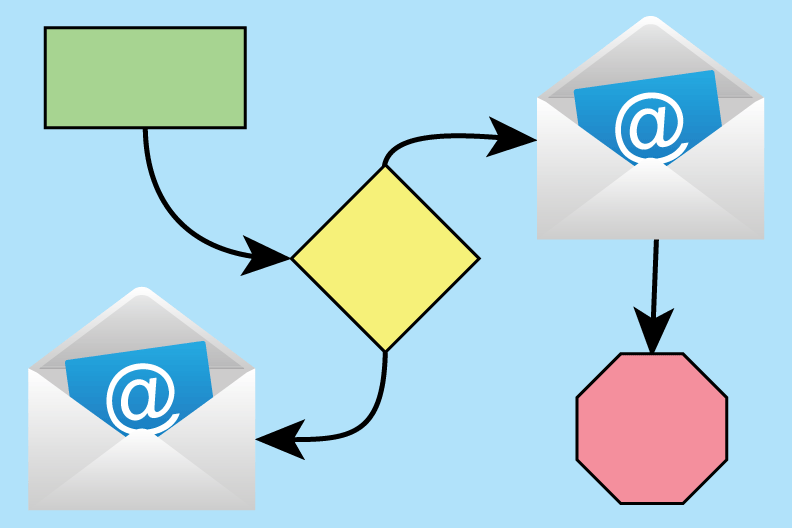 If you are not using automated email workflows yet, you might be leaving money on the table. While they can take some time to set up, studies show that automated workflows improve sales results and pay for themselves in no time. There are many interesting things that can be done with a flexible automation tool: drip campaigns, on-boarding programs, and shopping cart abandonment, to name but a few. But how do you get started implementing some of these programs? Let’s take a look. Your ability to personalize and tailor a program to an individual depends considerably on what you know about that person. You cannot, for instance, address someone by their first name in an email if you don’t have that information as a field in your demographics. Collecting useful data and providing it to your digital marketing solution is key to the success of any email marketing program. When working with automation, data is also king. A shopping cart abandonment program will only work if the data indicating an abandonment can be transferred from your shopping cart software. That leads us to the next question: How do we get that data into our system? With automations, the sooner you can act on the data you’ve collected, the better. The ideal situation is when data can be transferred immediately. This is generally done through an API call responding to something that happens outside the system, such as a cart abandonment, a webinar sign-up, or a white paper download. If possible, you’ll want your programmers to setup a call to the digital marketing platform to transfer this data and activate the automation as soon as an event has occurred. If it’s not possible to transfer data in real-time, you can try collecting the data once a day and transferring it to your digital marketing platform. This is an imperfect solution, however. Most people nowadays expect near instantaneous responses, but some examples where a response delay is more acceptable include, a drip associated with a webinar, follow-up to an event, such as a trade show, or something long term, such as a birthday reminder. If you can’t get real-time or batch data out of your internal systems, don’t panic. There are some situations where you can automate actions based on the data that is already in your digital marketing platform. One example is an on-boarding program. When a new recipient is added, they are automatically added to a drip campaign that provides automated emails to help them get started. Another example is automation based on open or clickthrough behavior. This can be dangerous, as many recipients don’t react well if they feel that their actions are being tracked, but it can be a useful tool to send administrative alerts to the salesperson or follow-up on the recipient’s demonstrated interest. So, what data should be provided in external data tables to facilitate a good automation program? Obviously, the email address. You won’t get far without that one. The email address is also the best identifier of each recipient since it’s the one piece of information that will be unique for everyone. Beyond that, it is a question of which data is actionable by your automation tool. You should be able to offer different paths within the automation flow based on the data provided. For example, knowing the date of the webinar will allow you to coordinate the drips so they are sent at the appropriate dates and times before and after the event. Another important consideration is what data you will want for merging purposes. As an example, a shopping cart email that references some vague statement like “there are items in your cart” will not be as effective as one that references the specific item(s). The data may be usable in its native form (names, dates, and such), or it can be inserted into the message directly as HTML (as an invoice layout, for instance). You’ll also want to look at the capabilities of your automation tool to make sure that it can handle simultaneous workflows for the same recipient, and that previous data is available for decision points in the workflow. If you offer events that have any overlap, like several webinars a month, it is important that your workflow can handle keeping track of which webinar the recipient has and hasn’t signed up for. Additionally, using the data from previous events can help you make the best decisions within a workflow. For example, you may offer a discount for a redeemed shopping cart the first few times a recipient abandons, but after a pattern of abandonments has been established you may want to cut out the discount to make sure recipients aren’t gaming your program. A good automation program should allow you to make decisions based on this previous history. Gathering data for your automation, deciding what data should be collected, and making a workflow that is intelligent based on past behaviors are several of the key things to consider when starting an automation program. After that is specifics of the different types of workflows, which we will look at in subsequent blog posts. Next: Part Two—Creating an On-Boarding Drip Campaign. This entry was posted in Automation, Dynamic Content, Email marketing, Workflows on October 23, 2015 by Jim Morton.